"The compact crossover segment is a blooming and booming one, and most manufacturers are going with their own interpretation of what a ..."
The compact crossover segment is a blooming and booming one, and most manufacturers are going with their own interpretation of what a versatile crossover should be. Lexus is no exception and the luxury brand is going after a few well-established competitors with its brand new 2015 Lexus NX. New to the Lexus family for 2015, the NX’ design draws from the other members of the family's with the hourglass-shape grille and arrowhead LED light strips that underline the headlamps. The elegant curves of the massive front portion give the vehicle a certain presence on which the automaker is betting to make its prized pony stand out from the flock of compact SUVs already on the market. The silhouette is attractive and not as bulky as other models, with sharp and structured angles towards the rear portion and the arrowhead motif repeated on the taillights. 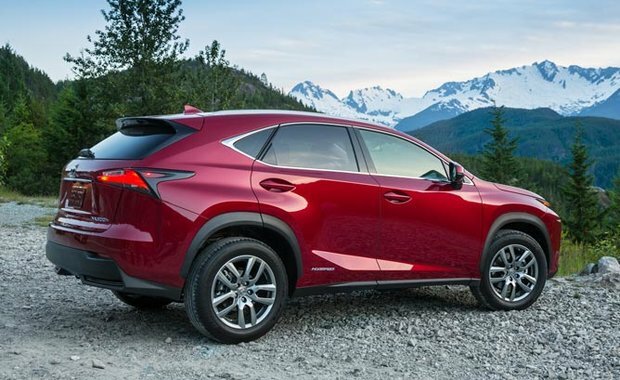 With a length of 183 inches, the Lexus NX is about the length of a sedan and just as easy to maneuver and park. The interior design matches the exterior's in sophistication thanks to leather with contrasting stitching and chrome appliques tastefully scattered across the dashboard. The instrument cluster is sleek and the center console integrates well into the cabin. It integrates technologies such as a wireless charging station for compatible mobile phones and the Remote Touch Interface, similar to a laptop-style trackpad, that allows you to easily navigate the multimedia system. Part of the Lexus safety features found aboard the NX are the HUD, or head up display of the vehicle’s information, such as the speed and the fuel economy, but also a dynamic cruise control, a backup camera, lane keeping assist system, rear cross traffic alert and pre-collision system, to name but a few. The model has already received the title of top safety pick + from the IIHS. The all-new 2015 Lexus NX comes in two variants: the NX 200t as well as the NX 300h. The “t” stands for the 2.0-liter, 4-cylinder turbo engine the 200t is equipped with, developing a sufficient 235 hp and rated at 8.4L/100km on the highway and 10.6L in the city. As for the “h”, it is the known designation for the maker’s hybrid models. The 300h comes with the 2.5L, Lexus Hybrid Drive engine, and that should offer a combined fuel consumption of 7.4L/100km. As with many models from the Lexus lineup, an F-Sport variant of the 2015 NX is also available with a specific grille, bigger sets of wheels and a selection of interior accessories. Come and meet the all-new 2015 Lexus NX at Lexus Kingston and see how the newcomer will measure up to its competitors.